The two biggest online sale, Flipkart republic day sale and Amazon great Indian sale has been started from today i.e 20th January 2019 and will continue upto 22nd and 23rd January. So in this writings you will get to know about some product you should consider while buying from Flipkart & Amazon. 10% instant discount upto Rs 1500. 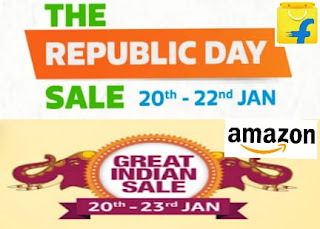 In the Republic Day Sale, Flipkart is also offering some attractive offers. It is offering 10% instant discount with SBI Credit cards. And many more like from fashion from here. I hope you find this helpful. Our advice would be to check both Amazon and Flipkart before buying.